A few new necklaces I made this week. If they make it through the weekend I will list them in my online store next week. Or if you see one you like and don't want to wait just send me an email! A hand blown glass teardrop I picked up at the Portland Sunday Market mixed with agate and copper. All have sold. Ocean jasper pendant with a pewter starfish charm and translucent gold iris and rust glass seed beads. Sold. When you look up birthstones you find there are several different lists to use. The Modern Birthstone List contains the official birthstone list from the American National Association of Jewelers. These gemstones were officially adopted in 1912. In the US, this is the accepted list. Then there is the Traditional Birthstone list which contains older birthstones and is sometimes combined with the modern birthstone list. These stones reflect societal birthstone traditions, heralding back to the 15th century. Other lists are of ancient origins. The Mystical Birthstone list comes from Tibet and is over a thousand years old. The Ayurvedic Birthstone list is from Ayurvedic Indian Medicine - a type of medicine used for over a thousand years. 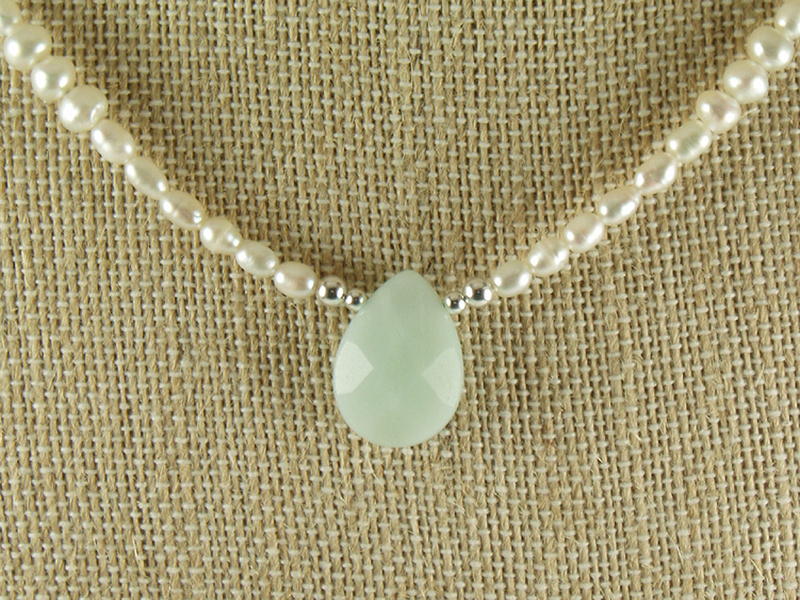 The listing for June gives pearl and moonstone as the modern birthstones. Traditional is Alexandrite, Mystical is moonstone and Ayuvedic is pearl. 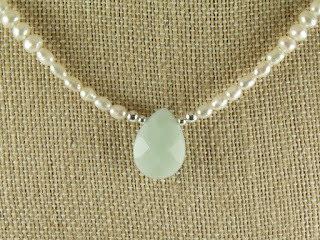 Occasionally you may also see opal listed as a birthstone for June. If you look up the birthstone for the astrological symbol of Cancer (June 21 to July 22) you will find Emerald, Moonstone, Pearl and Ruby listed. 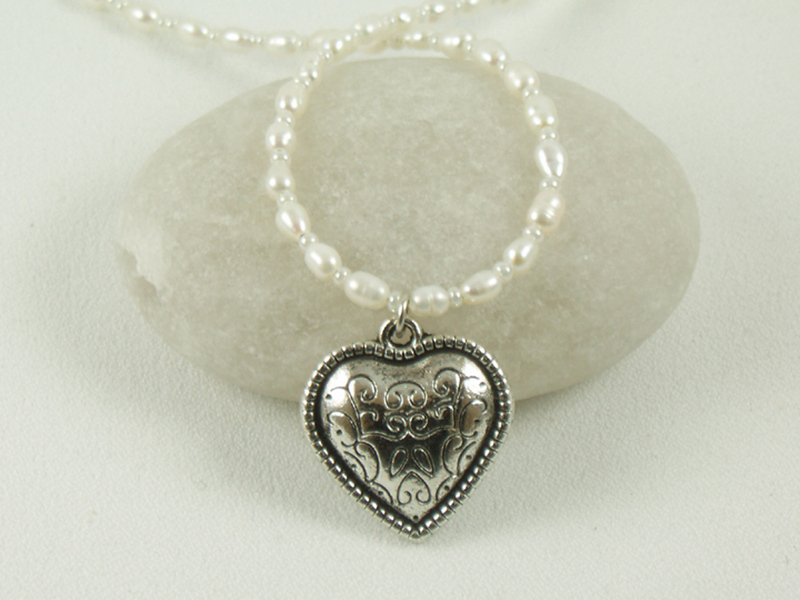 Pearls are also listed as the birthstone for Gemini (May 21 - June 21). 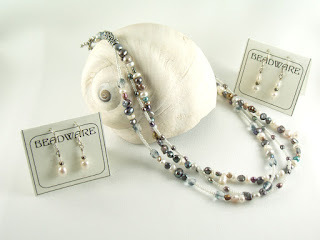 I have always made a variety of pearl necklaces, bracelets and earrings. 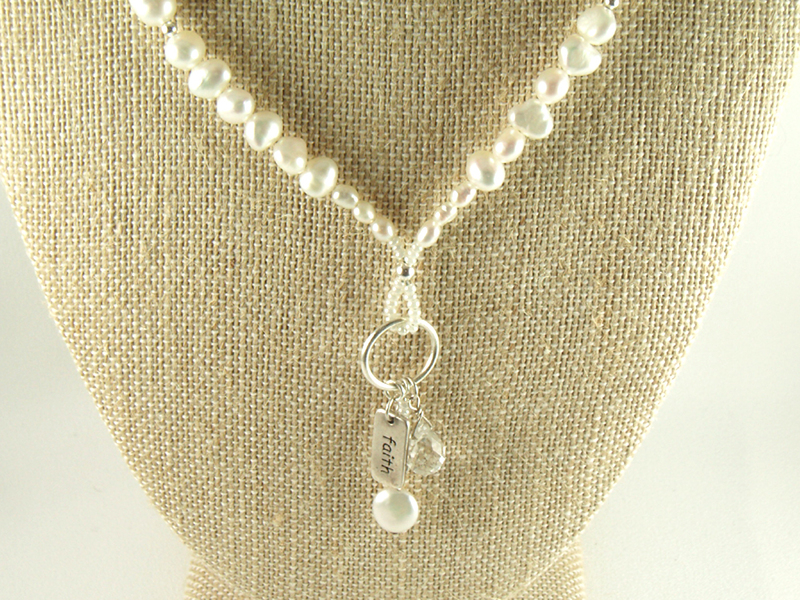 Pearls symbolize purity love, success, and happiness. Freshwater Pearls are the gift for the 1st year of marriage and pearl is the anniversary gemstone for the 12th and 30th year of marriage. Care and treatment: Pearls are less durable than most gems. They are sensitive to acids, dryness, and humidity. If you wear cosmetics, perfume or a hair spray, put these on before wearing your pearl jewelry. 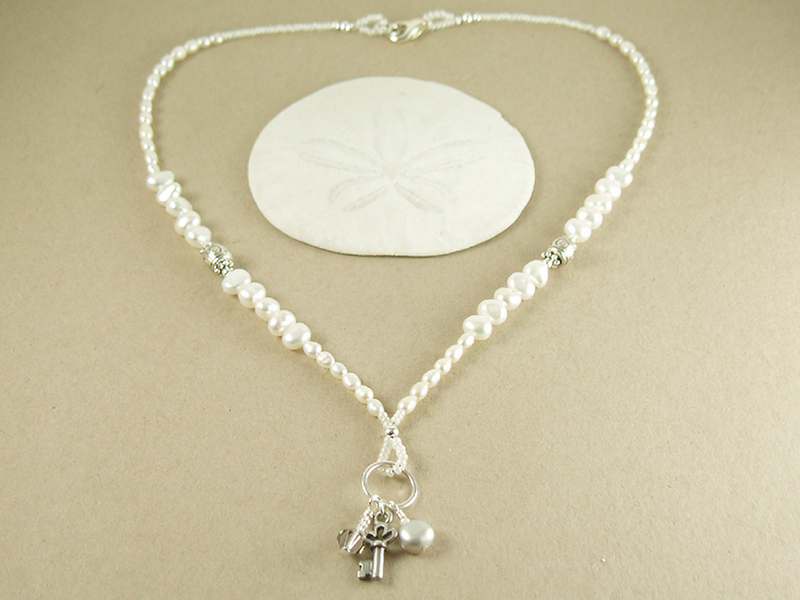 When taking off your pearls, wipe them with a dry, lint-free cloth. If needed, clean your pearls with warm soapy water being very careful to not get water into the drill hole as the pearl may discolor. Dry your pearls flat on an absorbent soft (preferably lint-free) towel. 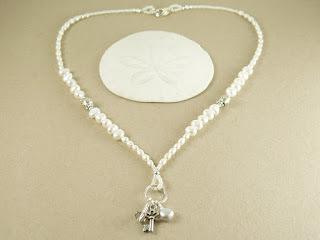 ** Healing ability: Pearls eliminate emotional imbalances. They help one master the heart chakra, aid stomach, spleen, intestinal tract & ulcer problems. ** Mystical power: Pearl is said to help one see themselves and help improve self-worth. Said to attune all 7 chakras and bring a soft, healing energy during meditation. I was adding to my pearl selection yesterday. Many of these will be posted to my online store soon - or just send me an email if you do not want to wait. 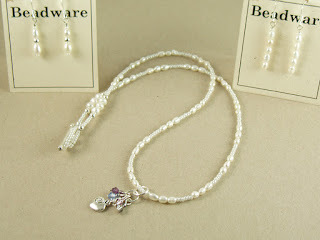 Pearl bracelets with a chain clasp that adjusts to fit anyone. All have sold. Key to My Heart. Freshwater pearls mixed with pearlized glass seed beads. 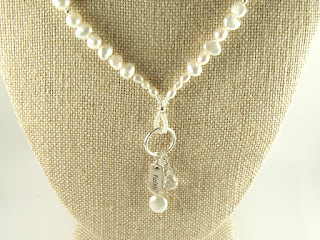 The dangles are a small key, grey Swarovski crystal and grey pearl. This one is 17.5 inches long plus a 1.5 inch dangle. Sold. A pretty pale blue agate on a stand of freshwater pearls. Sold. 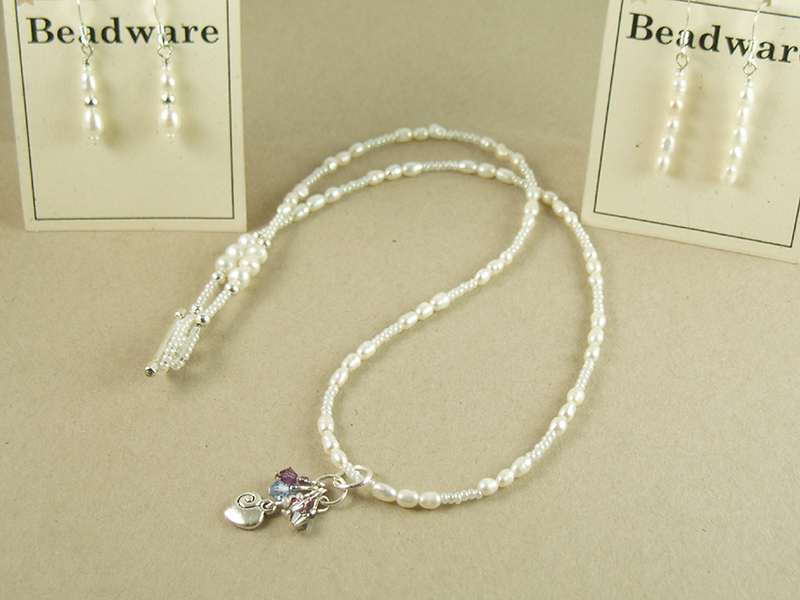 Freshwater pearls with a dangle of Swarovski crystals and small heart. Sold. My sister had a favorite piece of costume jewelry on elastic string that had lost its stretch. That is one reason I do not use that material. I use high quality beading wire for the majority of my work . It consists of 49 individual strands of stainless steel wire, bundled in seven strands of seven wires each. The wires are twisted together and coated with nylon. This allows the use of a soft, flexible wire while still maintaining excellent strength. The result: a supple wire with a beautiful, natural drape that's made to last. The new version of the bracelet will no longer stretch, so she will need to use the clasp to put it on. But it will now never need to be restrung. I was also recently given this necklace by a friend who wanted something a bit mroe elegant that the plain cord it was strung on. I played with a few different materials and in the end I selected small rectangles of iolite to accent the color of the stone. They were large enough to balance the weight of the stone while still giving it a more casual feel. I fashioned a small bit of silver wire into a simple pendant hanger. Some fun trivia about Iolite - It is known as the Vikings' compass due to it's ability to determine the direction of the sun on overcast days. When the legendary Viking mariners sailed the wide ocean, they used thin pieces of iolite as the world's first polarizing filter. Looking through an iolite lens, they could determine the exact position of the sun, and navigate safely. 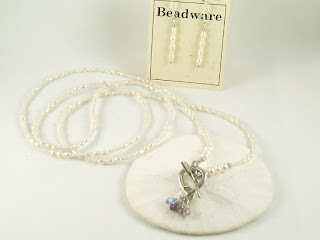 Lately I have been making mostly stone and pearl necklaces. Today I went in a different direction. The first necklace is a mix of glass black seed beads, black Czech crystals, green glass teardrop beads, gold plated pewter and a hand blown glass pendant that I picked up a while back in Portland. This has sold. 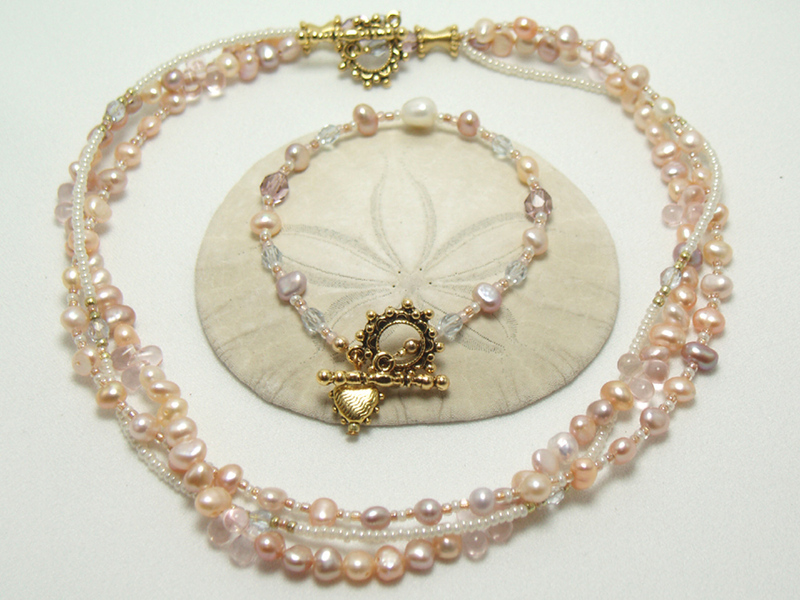 This morning I remade another pearl necklace. It has gotten plenty of attention in my booth, but is never quite right. It is long and has the clasp in the front. I made it into a bracelet and shorter necklace. The last necklace I remade sold at its first show. We'll see how this new one does. Sold. In July and August I will be busy with shows every weekend. So now is my time to restock. This week it was ankle bracelets, eye glass leashes and pins. I only make a couple of the most popular designs of ankle bracelets anymore. This week it was rainbows and bits 'n pieces, 6 of each and in small medium and large.$15. Next up eye glass leashes. Several of each color, blues, bits 'n pieces, pinks, browns. $20. I hope these last a while so I can focus my energies on some new designs. Remember if you see anything on my blog that catches your eye just shoot me an email and we can fix you up. In the past I have wrapped the shutters that my earrings are displayed on with plastic wrap - which is not only expensive but wasteful. Last summer while at the Lavender Faire I met a seamstress who helped me come up with some covers for them. She spent this winter tweaking my design (with help from her engineer husband). She found fabric that met all my criteria - washable, durable, water resistant, a little bit of stretch and soft on the inside. I have been using them since the first weekend in May and I love them!! I usually am putting them on while the shutters are hanging, but this was my test drive at home. They have a nice pocket at the bottom to catch any wayward earrings. I discovered this works as planned when a pair leaped off their card in Wenatchee. Their is a velcro strip along the length of the front as well as top and bottom. There are also button holes at the bottom for the eye hook. I run a rope thru these when the shutters are hanging to help stabilize them. The top flap extends over the hangers. This protects things in transit and makes them fairly weather tight. At a show this last weekend in Anancortes they got rain tested. The tent walls were wet and there were some drips from the roof. The outside of the covers were damp in spots, but the earrings were nice and dry! I LOVE my new covers!! They are so easy to get on and off and one person can do it by themselves. Thank you Lorie, seamstress extraordinaire! !